Today was the day for some time off after a few weeks of solid work. So I took a leaf out of Tara's book and had a lie in! Then there were some good tennis matches to watch...well, first day of Wimbledon, it would have been rude not to! I should say here that I was writing all this yesterday ie Monday, and had almost got to the end of this long post when something happened, I think my thumb slipped onto a mystery key, but, whatever it was, it deleted the entire post, words and pictures! Ggggrrrr.....I just didn't have the heart to re-do the whole thing from scratch last night. Maddening. Tara is mum and dad's cat and the lovely picture above is of her fast asleep in my bed at their house. I really miss not having kitty feet padding around, so it was a treat to have her company whilst we were house sitting a few weeks ago. 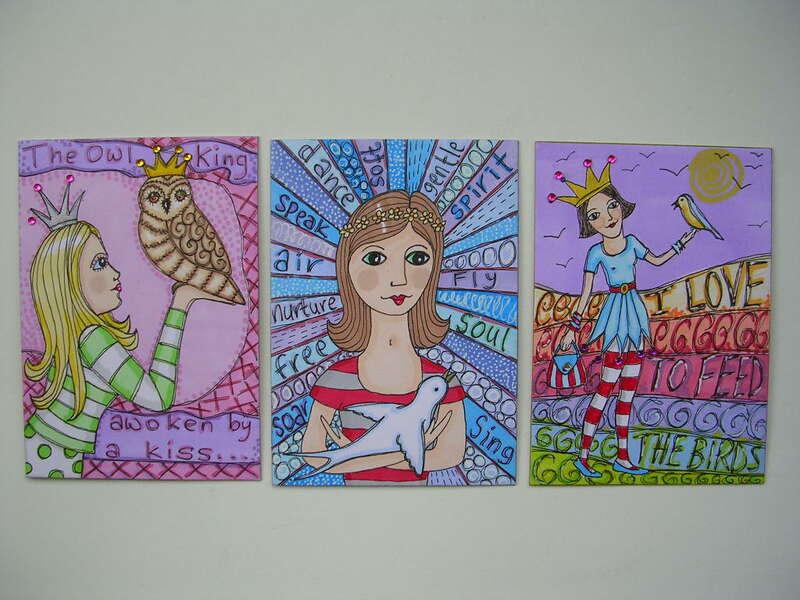 The next picture is of the three ATC's which I made for Heather's swap last month. The theme was "A little birdie" and the only rule was that there must be a bird and a figure on each ATC. I decided to draw my own designs for these, so I pencilled the images in, inked them up with my 0.05 pen, coloured with Promarkers and then added extra details with more pen work. 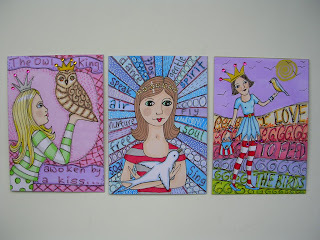 I hope the recipients liked them as I had great fun creating them! If you fancy joining in one of Heather's monthly swaps check out her blog (in my blog list at the left) and just email her - then you can join in as many, or few, of the swaps as you want to. While we were away I did a demonstration at Windmill Crafts in Thornton and managed to get a photo of Terry trying to sneak off with more of my stash in his sling! He would have got away with it if he hadn't been so over enthusiastic - I think my bright orange guillotine was just a little ambitious! For anyone who hasn't read my earlier posts, there is a long standing joke now that Terry pretends to pinch goodies off my table and I take a picture for the blog - poor Joanne (Terry's wife) always looks mortified but it's very funny! Best wishes to them both at the moment because now Joanne has had a "trip" as well - I think they need to start taking more water with it! (Only joking!). The card below was made using one of my new character stamp sets. This one is Finlay the frog (PICSA6113 Prince Frog) and I stamped one of him lying down and then used several impressions of the sitting version to create the crowd behind him. I simply cut the grassy strips with my scissors, but the Martha Stewart grass punch, or fringing scissors give a really good effect if you have them. I used the crown and message from the same set. The frog stamps are great for male cards...which man wouldn't like to think he was the real Prince! As you can see, I enjoy making fun, whimsical cards, but I also love making more artsy pieces as you will see further down. On Saturday I was at Dawn's studio where I was teaching a workshop entitled "Secret Canvas". One of the ladies attending was Sheila and she completely overwhelmed me by bringing a wonderful gift that she had made especially for me. It's a box which Sheila has made and decorated with friendship definitions. Inside are five RAKS, one of which is made using my TSV stamps! The remaining ones all feature Aliced in Wonderland images. Sheila, thank you again for this beautiful gift, you are an extremely generous and talented lady. These pictures are of the sample which I made for the workshop, showing the front and back of the canvas. The colours don't look as vibrant as they really are, but I used ochres and gold combined with teal as my pallette. The flowers are all hand dyed ( a technique I'll be demonstrating in my next few demonstrations) and the "secret" area in the back has a mixture of photographs, a "love letter", a lock of hair (mine! ), an altered matchbox, flowers etc. intimidated by the stark white canvasses to begin with, so I got everyone to sponge paint on them straight away - amazing how some colour makes an empty space less scary! We then used tissue to create texture, added crackle paints, grungeboard letters and stamped images. As you can see, everyone was soon getting quite engrossed in their pieces of art . Here's a face that many of you will recognise! Amy made a very girly pink and lilac version, complete with fairytale castle and winged key, for a little girl's bedroom. Below you can see Sheila's canvas coming together. It was, as always, fascinating to see how different everyone's style was. We had a lot of fun, with lots of laughter throughout the day, and we over ran the allotted time too! I think that all the ladies were going to add extra ephemera, charms etc to their creations once they got home as well. From the left we have Elaine, Lesley, Sheila, Kath, Sarah and my sister Heather. No Amy on the picture as she had to get back to work before I took this. Kath and Elaine came in to see me the next day to show me how Kath had finished her canvas off with lots of extra embellishments. If you fancy coming along to one of my workshops, keep checking the "demonstration dates" section on here for what's coming up. My next one is on Saturday 17th July and is a Ranger techniques class where we will be using all sorts of different Ranger products and each technique will be used to make an ATC sized aide memoir with the option of putting them all onto a ring to keep them together. If you'd like to book a place, please contact Topaz Crafts directly - not many places left! 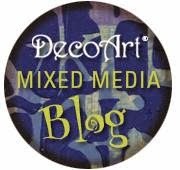 The last couple of photos are of a little tin that I altered using alcohol inks and stamps. The images are all Darkroom Door by Rachel Grieg - a really talented photographer who then turns her images into superb rubber stamps. I highly recommend them as they are not only wonderful images but they stamp beautifully. I used the inks to colour the outside of the tin. I then used Rachel's butterflies, flowers and words (from the "Wildflowers" set) to embellish the lid. For the inside I ditressed some cream card with inks and water and stamped a Tim Holtz message onto the one for the base. I hand dyed Petaloo flowers to match and added these, as well as two velvet butterflies, also from Petaloo. It's just a whimsical piece, not practical at all, but I like that! I stayed with Rena and Stephen (Amy's mum and dad) on Saturday night and little Alicia was staying over again too. No "Cockle Overs" (forward rolls!) this time, but, instead, we were making some felt monsters which later became characters in a puppet show with Alicia and I behind the sofa enacting St George and the dragon! Stephen filmed the whole thing and has threatened to add it to the Topaz blog, so myacting skills (!) may well be there for all to see! It was a lot of fun! On Sunday I was demonstrating all sorts of techniques at Dawn's studio and must thank everyone for their lovely compliments about the TSV and also for the gifts which I received - there are some lovely, kind people out there! Thoroughly enjoyed reading this post and seeing some of your photos. I say some because my mobile web is not so good here in Dorset. 'Peg leg' is resting after the long trip yesterday but I will show him the pic. of him later. Would have loved that workshop but never mind, I'll see you at the next one. Golly you sound so busy just now! Sounds liek fun. Love all the artwork, Shelia's things are brilliant. Poor Joanne and Peg Leg seem to be constantly in the wars just now!!! Had a wonderful time at your demo in Edgely, hope to get on the Dawn Bibby class next Saturday failing that will see you at the demo on Sunday. really inspired me into card making usually more into scrapbooking, but just love your techniques.